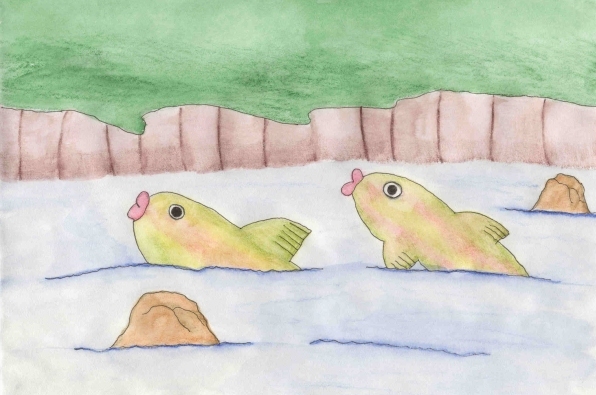 Brooke and Olive were two fish that lived in a deep, crystal-clear pool at the top of the mountains. The wintry, highland air had caused a thin layer of ice to form on top of the pool, trapping the fish below. One day the spring sunshine burst through the thick gray clouds and its warming rays caused bits and pieces of ice began to melt. The water in the pool bubbled over the top of the ice through the small holes and soon was flowing down the mountainside into a much larger loch at the bottom. Brooke and Olive were tired of being trapped under the ice and longed for an adventure and a change of scenery. "Brooke, let’s follow the river down to the loch below. I hear there are a lot of other trout there," said Olive. "Good idea. I am rather bored with this mountain pool," Brooke sighed. The two fish swam under the ice into the swift flowing water that ran under and out of the pool. At first they were caught in the fast current. It was hard work for the fish, since they’d been in such a calm place, but soon they remembered how to control their fins and tails and were on their way. As they swam down stream, they felt the sun shining on them from above. It felt good on their slippery scales. Brooke looked all around. "This is beautiful," she said. "I’ve never seen anything like this before. Look at the moss-covered rocks up there. See how green they are. I’m going to swim over to them and rub my scales on them and see how it feels," announced Olive. "Come on, Brooke. Come with me." Gently the two fish pressed their scaly bodies against the soft moss. "Oh, this feels good," Olive smiled. "We didn’t have anything like this in the pool in the mountains. It’s a brilliant color of green, isn’t it, Brooke?" Brooke brushed her tail against the moss. "You’re right, Olive. This feels great and the moss looks like soft, crushed emeralds." After a few minutes, they left and continued down the stream. Brooke noticed a lot of trees growing along the banks. Their limbs hung over the stream. Some had long, slender leaves. Others had fat, round ones. She thought one tree was particularly attractive and swam over to see the leaves that were dangling above the water. "Olive, come quickly," she called. The two fish stopped in the water to watch a grasshopper that was sitting on one of the leaves. "Are you thinking what I’m thinking?" Brooke asked her friend. "If you’re thinking that the grasshopper would make a good meal, then yes," answered Olive. They didn’t move, but stayed still, watching the insect. Its antenna wiggled about and its legs rubbed together. "I can hear it singing," Olive giggled, but she was far too hungry to pass up such a tasty morsel. Suddenly she jumped out of the water, caught the grasshopper in her mouth and splashed back down into the stream. The two fish shared the meal and then continued on their journey down stream. They passed by several picnic tables that were sitting at the edge of the water. People had spread tablecloths on them and Brooke could see baskets of food. They had to be careful and watch out for the children playing near the banks. Some were throwing rocks into the water. Others were trying to dam the stream by putting logs and rocks across it and patching the holes with sand and mud. Luckily Brooke and Olive made it past before they were trapped. "Mommy, I see two fish," cried one of the little boys. "I see them too," shouted a small girl. "Daddy, where are the fishing poles?" Brooke and Olive swam as fast as their tails and fins could take them. They didn’t want to be caught on anyone’s fishing hook. After a few minutes the stream became deeper, wider and rougher. "Oh Brooke, there are so many big stones. I’m scared," said Olive, and she had the right to be. The rocks were huge and jutted out of the water. The stream was now a raging river. They were in a torrent of water, being tossed about in the current. Olive was almost dashed against a sharp boulder and had barely missed it. The two fish stayed close together as they were carried over a small waterfall. They found themselves at a much calmer, deep pool at the bottom of the falls. Brooke said, "Wheeeeeeeeeeee! That was fun, wasn’t it, Olive?" She was laughing. She had enjoyed the excitement of the falls and the rapids. Olive didn’t think it had been too much fun. In fact, she felt as green as her name. "No, I didn’t think it was fun at all," she said, swimming away from Brooke and continuing down the river. Brooke caught up with her and the two swam on. They saw tiny clusters of wild violets, primrose bushes full of pink, fragrant flowers and clumps of bright yellow buttercups growing along the riverbank. Olive felt better now after seeing the beauty of the flowers. They had cheered her up. At last the river poured into the loch at the bottom. Brooke and Olive turned around and looked back at the river and the mountain they’d left behind. They were a little bit sad at leaving their familiar home, but happy thinking about their new life in the much warmer and much larger loch. They began to see other trout swimming about in the water. The two fish swam into the center of the deep loch, glad that they’d had such a great adventure and excited about the one they were about to begin in their new home.